Scrappers who want to earn money by collecting and selling ferrous scrap metal in Acushnet and all over Southeastern Massachusetts had better be prepared to do some heavy lifting. Pound for pound, non-ferrous metals often weigh less per item and are worth more at the scrap metal recycling center. But there is a lot of money to made collecting and selling scrap metal, regardless of which type you choose to specialize in scrapping. Compared to non-ferrous scrap metal, ferrous scrap metals, which are easily identified through the use of a magnet because of their magnetic properties, are much more plentiful and easy to locate for scrap. So while it isn’t worth more to sell by the pound, you can easily make a good return collecting it because there is more of it available to sell. When it comes time to sell the ferrous scrap metal that you have collected, you’ll need to locate a reliable buyer. Mid City Scrap Iron & Salvage in Westport has been servicing local customers throughout Southeastern Massachusetts for over 80 years. The family owned and operated scrap metal recycling business buys both ferrous and non-ferrous scrap metal, providing their customers the best prices for iron, steel, copper and aluminum in the South Coast region. Those new to scrapping might not know that there are different grades of ferrous scrap metal that can be recycled or sold in the state of Massachusetts. If you aren’t sure what you have or would like help finding out where to recycle your #1 steel or light iron at Mid City Scrap, just ask one of the Scale Operators for assistance. 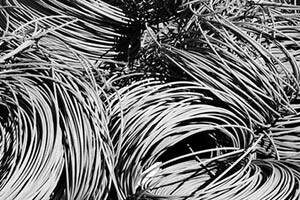 They can help you identify the different grades of ferrous metal in your haul so you can get the best prices for selling ferrous scrap metal in Acushnet and the surrounding area. When you come to sell your scrap metals, you should always separate ferrous and non-ferrous scrap before you get to the scrap metal recycling center. Furthermore, once you learn how to identify different grades of ferrous scrap metal, you should separate them by type as well to streamline the weighing and selling process at the scrap yard. This will ensure that you receive proper payment for all of your recycled items. Iron and steel are the two most commonly used types of ferrous scrap metal in America. You can make money collecting and selling scrap metal that is found in items such as automobiles, containers, cans, appliances and materials discarded or leftover at construction sites. It is important to make sure that you collect these materials legally and ethically, making deals with industrial, commercial or construction sites to remove unwanted metals. You can also work with homeowners to pick up and recycle unwanted appliances or other metals discarded during renovations or remodeling projects. Other sources include cast iron, which is found in pipe, machinery, cookwear and engine blocks; pressing steel, which is found in hot water heaters, water tanks and roofing iron; rebar or mesh, which is used with concrete in the construction industry; and manganese steel, which is a non-magnetic, hardened steel that is used in rock crushers, cement mixers and other heavy-duty machinery. Again, always make sure you are collecting and selling ferrous scrap metal in Acushnet according to local scrapping laws and regulations. Scrappers do a huge service for the surrounding community. Not only is scrapping a great way to make extra income or build a scrap metal recycling business, but it is also good for the environment. The more items that get recycled and re-used through scrap metal recycling businesses like Mid City Scrap Iron & Salvage in Westport, the less items find their way into the local landfills throughout Southeastern Massachusetts. Statistics show that Americans are doing more scrap metal recycling than ever before. In 2008, over 97% of the structural steel and nearly 100% of automobiles were recycled. The average household appliance is made up of 75% steel by weight, providing ferrous metal recyclers with a steady stream of scrap items to sell. The average automobile is made up of 65% iron and steel, making it another great source of ferrous scrap metal. Scrap metal recycling isn’t new. In fact, the steel industry has been doing it for over 150 years. It is more cost effective to recycle steel than it is to mine raw iron ore and process it to form new steel. When recycled, steel does not lose any of its physical properties. Using recycled steel also reduces the amount of energy and material requirements associated with iron ore refinement, reducing pollution and energy consumption by as much as 75% each year.